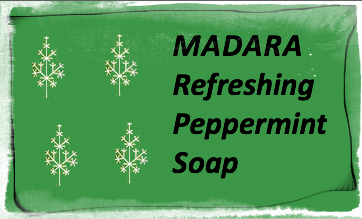 I've unfortunately just finished this lovely Madara soap now and thought it was high time i wrote it a review! I got this in a beauty box quite a while back and started using it pretty much straight away every morning in the shower. I knew i'd love it as i adore anything minty, i love the smell and the tingly feeling it can give. Very fresh and invigoration to wake me up and make me feel better about it being the crack of dawn. What's more the scent lingered a decent amount of time on the skin without being over powering or leaving a weird after scent. As you can tell i really enjoyed using it, not just for the great scent but also because it was such a mild yet effective soap. It left my skin feeling clean and refreshed without leaving it feeling tight or stripped of any oils etc. I think the Algae is meant to have a nourishing and cleansing effect. This product is SLS/SLES free but did foam slightly with from judging the ingredients i assume is from the sodium coco-sulphate. Now, i know some people may still not like it, but I've done my own reading on it and as it is a natural surfactant derived from coconut oil, I personally think it is absolutely fine to have in my products. Plus I do like a slight foam to my products so it makes it a little more enjoyable! 99% of the ingredients are natural which is great, i do wish that more of the ingredients were organic as currently it is only 5% but it is still ECOCERT approved so i can't quibble with it really. I know that the range of body soaps also includes Nourishing and Vitalising and at only £9ish I'd be happy to purchase one of these to see if it is just as lovely! Have you tried anything from the Madara range? What would you suggest I try next?